Adorned in each’s own take of classic ‘60s attire, the members of Lotela Gold flaunt the fringe, flowers and tie dye of music’s golden era at every concert. 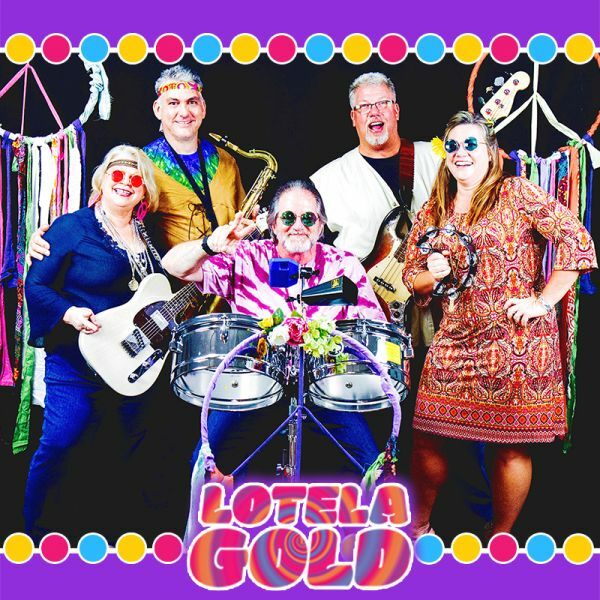 Lotela Gold takes audiences through a time warp, covering folk music from bands like The Mamas and Papas, Motown hits from Wilson Pickett and James Brown, rock favorites from bands like The Beatles and The Rolling Stones, as well as psychedelic classics from Cream and Iron Butterfly. Some special features include the band’s rendition of the Etta James classic, “At Last”, Otis Day and the Nights, “Shamma Lamma Ding Dong”, and the ever-popular drum solo from “Wipe Out”. This year's show, “Sounds of the 60’s”, showcases all of your favorite hits from the iconic decade. The ‘60s was a time where counterculture and the revolution of social norms thrived. Clothing, music, dress, society formalities and schooling, among other cultural norms, were all shattered, making the decade shine in America’s history, serving as a beacon of change in America. Lotela Gold is a five piece rock and roll show band celebrating the decade. The band features Eddy Webber on drums, Darrel Layfield on bass guitar, Sharon Corinne on lead Guitar and vocals, Angie Saunders on vocals, and Gary Johnson on sax, keyboards and vocals.